Marijuana and weed both refer to Cannabis, a plant which is popularly used to make a psychoactive drug intended for both recreational and medicinal use. Smoking this hallucinogen has short-term effects which include altered senses, mood changes, memory impairment, hallucinations, and delusions. The long-term effects include dependence, difficulty having children, breathing problems, and a general decline in mental functioning. Cannabis is also commonly referred to as pot and others call the drug ganja, cheeba, 420, and others. It has several names since the drug has been illegal in most territories and anything that needs to be underground naturally develops a code name. The usage of the word “marijuana” was earlier as compared to “weed” which is often used as a slang term. The following discussions further delve into the subtle differences between “marijuana’ and “weed”. Between 1910 to 1920, more than 890,000 Mexicans sought refuge due to the civil war which ended their dictatorship. Though the use of cannabis was already being previously practiced, the influx of the immigrants highlighted such herb-smoking culture. Twenty-nine states banned “marijuana” which was particularly associated with the minorities (Blacks and Mexicans). It is said that Harry Anslinger, the first director of the Federal Bureau of Narcotics, was very influential in associating the term with violent behavior and foreigners. Hence, Marijuana was mainly seen as one of the major causes of mind corruption during the Great Depression. As the zenith of Anslinger’s career, the “Marihuana Tax Act of 1937” was passed and “marijuana” has since then been widely associated with the illegal and violent-causing psychoactive drug. American Speech, an academic journal included “weed” as “Among the New Words”. It was defined as “marijuana cigarette”. 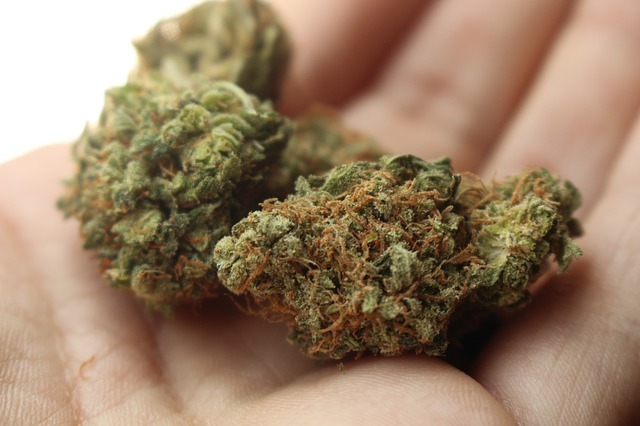 The Chicago Defender, a weekly newspaper, utilized the phrase: “the weed, the marijuana….”. Raymond Chandler, in his novel, “The Little Sister”, wrote: “They were looking for a suitcase full of weed”. According to Merriam-Webster, “marijuana” is hemp. It is also defined as “the dried leaves and flowering tops of the pistillate hemp plant…”. The same dictionary defines “weed” as “tobacco products” aside from the usual meaning which is undesirable plant. “Marijuana” was used before “weed” as it started to become popular in 1910 while the latter came in to vogue in the early 1930s. As compared to “marijuana”, “weed” is a slang term as it has been popularized by the newer generation. In 2017, Shawn Cleary, a councilor of the Municipality of Halifax (eastern Canada), made headlines when he stated that the term “marijuana” was “racist”. Cleary referred to Anslinger’s campaign in the 1930s which marginalized Mexican-American culture. On the other hand, “weed” has not be associated with the prejudice of any group. “Marijuana” is more of a generic term as it is mostly utilized by non-users whereas weed is more associated with cannabis users. “Weed” may be unsuspectingly understood as an unwanted plant while “marijuana” undoubtedly pertains to the psychoactive drug or hemp plant. “Marijuana” is utilized in various legislation proceedings such as “marijuana legalization”, and “federal marijuana law”. 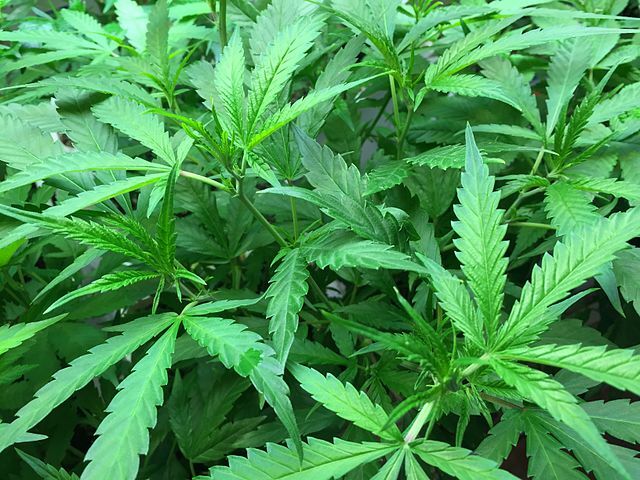 For instance, in section 19 of the National Organization for the Reform of Marijuana Laws (NORML), it states that “Marijuana means any part of the plant genus Cannabis whether growing or not…”. On the contrary, “weed”, being a slang word is not that utilized in formal situations. There are several notable groups bearing the term “marijuana” in different countries such as the Marihuana for Medical Purposes Regulations (Canada), National Organization for the Reform of Marijuana Laws (USA), and Help End Marijuana Prohibition Party (Australia). As for “weed” there are no known national organizations using the term. In 2013, Google books reported that “smoke weed” was used for 149 times. This is way more frequent than the result for “smoke marijuana” which is only 69 times. Moreover, the “weed” results understandably have a more consistent graph as compared to “marijuana” as it also pertains to the “undesirable plant”. As compared to “weed”, “marijuana” is more frequently associated with medical terminologies such as “medical marijuana”, and “marijuana card”. Marijuana and weed both refer to Cannabis, a plant used to make a psychoactive drug intended for both recreational and medicinal use. 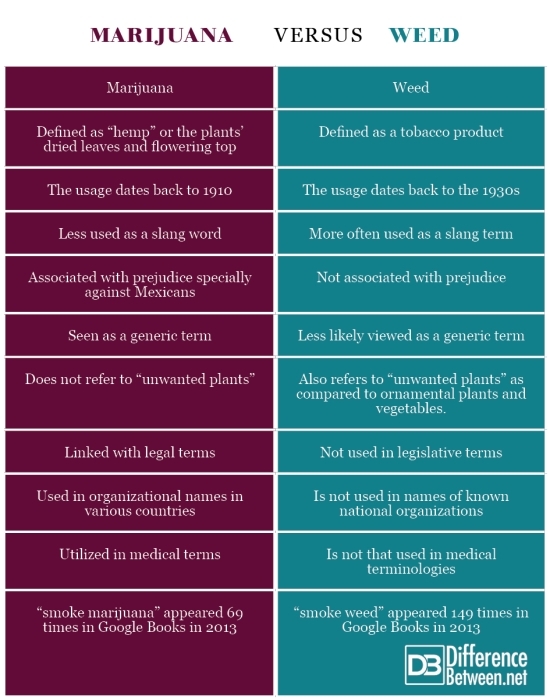 Merriam-Webster defines “marijuana” as hemp while it defines “weed” as a “tobacco product”. “Marijuana” was first used in 1910 while “weed” came into vogue in the early 1930s. As compared to “marijuana”, “weed” is a slang term. Marijuana is more often linked with legal, medical, and organizational terms. As compared to “smoke marijuana”, “smoke weed” is more popular in Google Books. gene balinggan. "Difference Between Marijuana and Weed ." DifferenceBetween.net. March 5, 2019 < http://www.differencebetween.net/science/health/difference-between-marijuana-and-weed/ >. Backes, Michael. Cannabis Pharmacy. White Plains, NY: Peter Pauper Press, 2017. Print. Blesching, Uwe. The Cannabis Health Index. Berkeley, CA: North Atlantic Books, 2015. Print. Schmader, David. Weed: The User’s Guide. Seattle, WA: Sasquatch Books, 2016. Print.